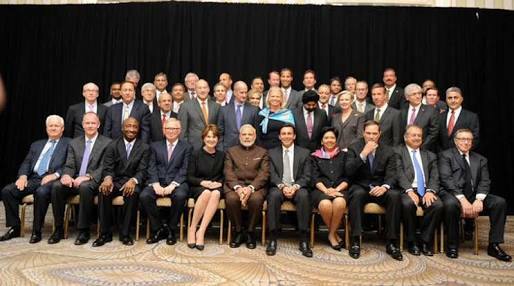 Prime Minister Narendra Modi, during his trip to the US in 2015, met with CEOs of companies with a combined worth of 4.5 trillion USD, more than twice India's GDP. The main takeaway from the trip was that India needs to work on infrastructure and ease-of-doing-business issues and laws that corporates find too restrictive. Many expressed their worry about Internet censorship and Government snooping, some about corruption and the bureaucrat-politician nexus and others about India's business laws. When we wish to invite billions of US Dollars worth of investment to India, we have to ensure that we project an image of a scientifically driven society, of a nation driven by the rule of law, by a judiciary that can be expected to deliver impartial judgments without bribery, by road and rail infrastructure that can support a business, by a Government that does not manipulate financial figures or browbeat its Central Bank. By an economy that is not driven by 'black' money. By politicians and bureaucrats who are not perpetually on the take. And most importantly, a society that is at peace with itself, without major social schisms and forces supported by the Government, driving those schisms. Let us for a moment imagine ourselves as the CEOs of multi-billion dollar enterprises in the US, seeking a cost arbitrage in a nation famed for its engineers, doctors and hard working people - all evidence available within the large Indian diaspora in the US. Surely, that knowledge alone cannot be the only reason I will pump in my billions. Before I do so, I will begin reading up, I will subscribe to news of that country, I will read up on their laws, culture, language and a thousand other things, including the pulse of its social media. Along the way I encounter, almost on a daily basis, the utterings of members of the highest legislative bodies of that nation, the comments by members of the ruling dispensation, the antics of various political and ideological partners, actual legislative actions against food habits, demands for further legislation on women's clothing, restrictions on women's movements and clothing in educational establishments, comments from the highest echelons of the Government, on the efficacy of bovine urine on cancer and of the ability of cow dung to neutralize nuclear radiation. A minister and a prime minister's comments on the wondrous technologies available to us five millennia ago - the ability to fly to Mars and transplant cross-species organs by choice. Then you read of minorities being targetted by majoritarian ultra-right gangs and the Government watching silently by the sidelines. Of attacks on women in broad daylight and misogynistic remarks by ministers in Government. Of Government snooping and control over the Internet. Of a celebration of poor education, as if we have become what we are because we sneered at education! Suddenly this place begins looking like a not-very-safe place to invest money than can very well liquidate my company, if I fail. I will begin reading up on other nations - maybe South Africa or China or Brazil, all nations who have the same skills that we are showing off, but who have stable, polite societies and political dispensations that are not at odds with themselves. 1. Ensure we are a secular polity, not constantly driven by a majoritarian itch to 'teach a lesson' to the minorities. This will create the image of a stable society, at peace with itself and able to use its energies towards nation building. This is probably the most important of things to do. 2. Respect the rights of the individual. There are no collective rights. All rights belong exclusively to the individual. Everyone's rights are circumscribed only where another's nose begins. I have the right to eat cowdung or meat or bitter gourds. No one has the right to curtail my right to eat anything, least of all the state. 3. Respect in society and the law, for women and swift legal retaliation against those who infringe those laws. Only then will more liberal societies think of investing in India. We must understand that those societies are well-to-do because they are liberal, not liberal because they are well-to-do. We have degraded our current polity to one that sneers at liberalism. That won't do! 4. We have to be seen as a society that runs by and respects the rule of law. From seat-belts to swift retaliation against the highest, even in the ruling dispensation, every aspect of our lives should be seen to be driven by the rule of law. And we certainly cannot be seen as a nation where judges can be bribed, cajoled, threatened or otherwise compromised by the State. 5. A removal of the violence of the state against its citizens. The Indian State is in a constant adversarial position against its citizens. Even the language of a common notice from any office of the state, contains language that is inimical to polite social discourse - it is threatening and talks down at the citizen. We have a police force that engages in arson, public loot and the destruction of public property. That collectively creates an adversarial relationship of the state with its citizens. That relationship will be visible to an investor! 6. Completely cease political interference of the State, in education and culture. We cannot be seen to sneer at education! To abusively promote the lack of education as a badge of honour! No! That's not what will ever get you any investment. 7. Discourage sneeringly abusive public discourse, aimed at pulling down every worthwhile achievement that our nation has made in the past only because it was made by an ideologically different dispensation. A Prime Minister who calls over to tea, the most violently abusive and threatening acolytes on social media, is not doing any good to the nation. He is only encouraging more of such boorish behaviour. One cannot by any stretch of imagination consider a constantly abusive society as one fit for investment. 8. Run Government with the advice of think tanks and through public discourse. No one human has the intellectual breadth to have answers to every issue. The perception that an entire Government runs at the behest of a single individual,cannot but take us into the same class as North Korea. No one invests in North Korea. 9. Educational qualification is always a plus. It garners respect and admiration. There is no money in the hands of those who do not respect educational achievement. Those who have the money to invest, always belong to societies with a deep respect for education. If we do not have the requisite educational qualifications for specialist Ministries, let us bring in qualified experts to man those positions, instead of turning the tables on education by sneering at those who seek more qualified persons to man those posts. 10. Do not tamper with constitutional posts. Instead create more. Constitutional posts were created so that they would be insulated from Government. To browbeat them or erode their autonomy does us no credit. In fact it creates suspicion in the minds of investors. The Election Commisioner, The Comptroller and Auditor General, the Governor of the RBI have been sought to be protected from Government interference, so that the image of our Government remains high. I suggest another new constitutional authority - that of the chief bean counter of the nation - the Head of the Central Statistical Organization. We cannot allow the impression to gain ground that the figures we report to the world have been manipulated by the Government. To illustrate the importance of such a move, after the Greek default on loan repayment, when the European Union and the World Bank sat down to reschedule Greek debt, one of the first stipulations was that the Head of the Greek central statistical organization would be decided by the EU and would be insulated from the Greek Government. Nothing can be worse than the world suspecting that our Government is fudging figures. certainly a bad idea when you're trying to attract investment. The CEOs had provisionally told us what they wanted, with the message "Please continue with your development; we're watching..."